Daisy was raised by Mr. & Mrs. P. A. Mathew of Pazhamchira family till her schooling was over in a small town of Vakattanam, Kottayam District, in Kerala. In the year 1979, she was introduced to the Hoskote Mission by Rev. E. J. George, and was under the care and concern of Late Mr. K. J. Abraham, and Dr. Mrs. Anna Abraham of Kizhakkethalekkal family. Daisy got groomed as a Crèche Nurse through KNH and joined the Mar Thoma Church Crèche Center at Wilson Garden, in the year 1982. Though a crèche nurse, she was keen in the overall development of the slum dwellers and was doing more than what she was expected to do. Subsequent to her graduation in arts from the Mysore University and Masters in Sociology from the Annamalai University, she served as a Social Worker at the Shivanapura Mar Thoma Day Care Center which was under the Mar Thoma Church's Hoskote Mission, from 1988. During her tenure there, Daisy started various projects, such as Mushroom Culture, stitch craft, leather craft etc., in the field of vocational training for the benefit of the rural youth of weaker section and also embarked on value oriented interventions like literacy promotion, leadership development, de-addiction etc. 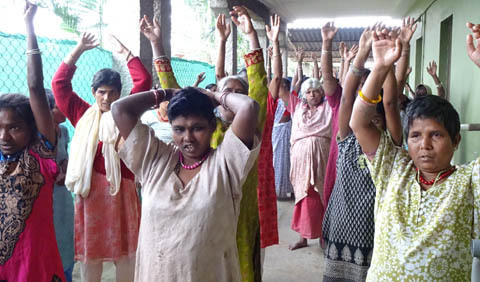 During 1996, the visionary in Daisy responding to the call from God committed to constitute an organization exclusively to express care and concern for the rural women suffering the culture of silence and that is how Vision India came into being. Leaving a safe and secure job that ensured her economic independence and social dignity, Daisy took a tough path that demanded too much of patience, endurance, hard work and above all sacrifice. It was not at all a surprise to see Daisy living with and nursing a few physically challenged women in her abode in Thavarakere tucked away from Hoskote. The scope of Daisy's mission got so enlarged that she started focusing her attention on mentally ill and vagrant women and the Abhayashram she founded on the 11th September 1998 became an abode of abused and ostracized women picked up from the hovels and highways. Her meager possessions such as a small kerosene stove to keep the kettle boiling and a moped to keep her looking for the wronged gullible weaklings virtually brought about a revolution in the ever exploiting world. Armed with her degree in law and registered as an Advocate in the Bar Council of Bangalore in 1999; Daisy emerged into a powerful woman committed to empower the poorest of the poor; particularly women in distress. Practicing in the court of law, coordinating affairs with the police force, tending the HIV positive inmates of the Abhayshram, taking them for treatment to NIMHANS, getting them rehabilitated were her commitment and conviction. Abhayshram over these years had been shunted from one place to the other on one pretext or the other. Nimbaikaipura, thought to be the best place turned out to be the worst with the villagers thinking that the home had brought evil unto them. Baktharhalli also could not accommodate the home for long until Pappanna a good Samaritan known to Daisy for two decades, the doyen of Katamnallur came to its rescue. As for the resource to sustain the mission, Daisy had her prime support from none other than her creator God; who through His children generously lent support. The support she secured from the World Council of Churches when she was invited to attend the Human Rights Conference of the Christian Council of Asia held in Bangkok came as a shot in the arm. Yet another resource package from Switzerland gave a bit more confidence though; local support generated from the congregation of Whitefield Church, the host of friends of VISION INDIA both within and outside the county keep the mission going. It was no surprise that she was accredited as “Vanitha Rathna” by the then Minister of Women and Child Welfare Mrs. Mottamma in 2002. 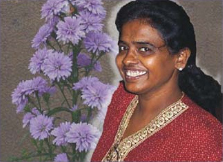 Survived a road accident in 2004 with a crushed leg though; Daisy was diagnosed as a patient of carcinoma colon calling for extensive treatment at the Christian Medical College (CMC) Hospital, at Vellore, Tamil Nadu. Her cure was medically impossible though; she never let anyone feel that her days were numbered. She showed exemplary strength of courage, indomitable will and steadfast faith in the Lord even as she was fading away until she went to be with her Lord and Savior, at 12:30 p.m. on 5th May, 2007. Her funeral service at the Hoskote Mar Thoma Church and subsequent burial in Gonakkanahalli Cemetery of the Mar Thoma Church on the 8th May 2007 indeed is historical. Largely attended by those who were touched by her selfless service, her well wishers and children of God, it was a manifestation of good work in the Lord's vineyard. A short an fruitful life of a single woman who dedicated the best part of her 47 years of life not only continues to be admired and adored but also remains as an inspiration for those who have dedicated themselves to carry through the mission initiated by Daisy!